I am still a bit amazed at how far I’ve come… I mean… how far God has brought me. And I’m also continually amazed at how well this covenant thing works, despite my slip-ups, because the food I eat and don’t eat are not that dissimilar to the ones I have eaten, and not eaten, on diets before. Only a big difference is the motivation and the accountability. And the biggest difference is that both the motivation and the accountability are from and with God. Before I would have used an upcoming event- a friend’s wedding, a beach trip, etc. as my motivation. And although those are rewarding, my heart and mind had gotten to the point where the “reward” of chocolate was MORE rewarding than the thought of something in the future. And so the only thing that would motivate me more was my love for God. Same with accountability- WeightWatchers staff… they were important but I didn’t care about their accountability as much as I “neeeeeeeeded” chocolate. My family members… who are the most important things in the world to me… but that chocolate would still supersede my love for them. (And that still pains me a bit to admit to even myself, but I can say that a lot of that was because the THINGS of this world were still so important to me that the eternal things, like love for my family, had wasted away). But my love for God was stronger. It is strong enough to make me obey Him. And that is how he says he wants us to show Him love… to obey Him. At a women’s retreat, Brenna Stull told a story (and the full, “live” version was way cuter, but this is a abridged version) about how she wanted to take a nap but she had a three-year-old who had dropped her nap, so she told her daughter, “You don’t have to sleep… all you have to do is lay still in bed with me and close your eyes.” Well, once they got settled in for a nap, her daughter started kissing her arm once, then two kisses, three kisses, then all the way up her arm. Finally, Brenna said, “I don’t WANT your kisses… I want you to obey me!” And I think that is where a lot of the reward in this covenant comes from… it gave me not only freedom from food, but a way to SHOW God my love… through obedience. A couple nights ago, I made a new page on the blog called “What I Eat”… super creative title, eh? Haha! Anyway, it was surprisingly difficult to come up with a list of the foods that I eat. I don’t journal my foods like dietitians often recommend… mainly because I want to pull my focus away from food. off of food. and back onto God. It just seems that journaling my food as I have done in the past for diets puts too much emphasis on food. Of course, I do think that journaling every single thing I eat for a few days wouldn’t have been such a bad thing if I wasn’t sure why I was gaining weight. In my case, I knew exactly what was the problem so there was no need for me to journal. I had journaled enough in the past to know that my eating was for all the wrong reasons, that I was overeating on almost everything, and that I was gorging and sneaking chocolate and other sugary things. Sure, I had been in denial several times before, blaming it on the cafeteria food at school, or on the fact that I gained thirty pounds from the time I started dating my husband until we got married because we were going out to eat so much, or that there were just always goodies in the lounge of the school workroom. But when it came down to it, I had to face up that it was because I was eating two meals worth of cafeteria food, eating two meals worth of fast food with my husband, and eating (and sneaking) two to three helpings of goodies from the lounge. For me, it wasn’t the what so much as it was the how much. So, I knew that I didn’t want to focus on food anymore. I wanted that focus to switch over to a focus on Christ. I knew… I just knew that would work. I needed a change and He is the Change Maker. So, instead of journaling my foods, I began the process of renewing my mind instead… or allowing Christ to renew my mind through the Word of God. My dear friend and former roommate, Beth, taught me years ago of the power of the Word to change my life. She has always been an avid Old Testament reader and could find a message or an example from the Old Testament to fit almost anything I was going through. I still glean hope and conviction from the verses in Deuteronomy 8 that she shared with me the summer before we started teaching and rooming together. But for a long time (until this covenant actually) I never really applied any of the truths of God from the Old Testament to my addiction to food. But now, the majority of my conviction and hope come from there. And now that I think about it, once again, Deuteronomy 8 is a perfect chapter for my experience with this covenant. For almost forty years, I have been humbled and tested. And although I think I missed multiple opportunities to turn to God for my deliverance, in the end… I did. Well, I am turning to Him still. Every day. And what a great “food message” in verse 3… it is not about the food in this “diet”. It is about every word that comes from the mouth of God. God hasn’t given me a new land, but he has given me an almost new life! In the days to come, as the weight slips off, and in the days down the road, when the weight has been off for years, as I believe it will be… Deuteronomy reminds me of how vital it will be to still praise The Lord My God for my new life. Ahhhhhh. There He is again. My rescuing God. And I am to attribute all success to… Him. Well, that should be easy since He’s done it all anyway! My oldest boy (he is 4 1/2) has been really into telling me about what he’s learning in church on Sundays in his class. Which I am esctatic about because that means that he is 1) really listening and 2) really interested! This past Sunday the lesson was about the ten men that Jesus healed from leprosy while only one came back. He looked at them and said, “Go show yourselves to the priests.” And as they went, they were cleansed of their leprosy. One of them, when he saw that he was healed, came back to Jesus, shouting, “Praise God!” He fell to the ground at Jesus’ feet, thanking him for what he had done. This man was a Samaritan. Now I think as adults we tend to analyze this a bunch of different ways, but the “kid analysis” was so simple and so brilliant. That was it. So simple. So true. It wasn’t shocking or anything but there was something about hearing it from someone else and especially since the “you” was in there- it made it… personal. January, you need to thank Jesus when he does something nice for you. Hmmmmmm- like healing me from a leprosy of my soul, for example? Because that is just what Jesus is doing for me. It didn’t necessarily happen in one flash of lightning, but just like those men with leprosy… it is happening “along the way”. Jesus. Where do I begin? Thank you for every moment of freedom that you have given me already. Thank you for every moment of freedom that I can look forward to in the future. Thank you for renewing my heart and for giving me an obedient heart. Thank you for helping me to bring my mind along with that same renewal. Thank you for the Word that you have given me. Thank you for the time to read it. And thank you for the way it changes me, renews me, purifies me. Thank you for healing me of my addiction to food. Thank you for my salvation. Thank you for loving me so much more than I could ask for. Thank you. Thank you. Thank you! Amen. I had a blunder tonight. Hmmmmmm, perhaps that is putting it lightly. Perhaps that is me not choosing the right word. Perhaps that is me trying to go easy on myself. I’m going to try again. I broke the covenant tonight. Yep. Broke it. Shattered it. Demolished it. Cause that’s what happens to an agreement when one side “breaks” their oath… their bond. The “agreement” is null. void. pointless. non-existent. Okay, okay, I’ll stop being over dramatic (not that me being over dramatic is a shocker to anyone who knows me). Here’s what happened: I planned a nice meal for us and I even reveled in it during day forty-two’s post: potato and carrots in an onion sauce, baked apples, and a salad. Only, let me just tell you that the baked apples weren’t so much just “baked apples”. It was a Baked Apple Crisp. 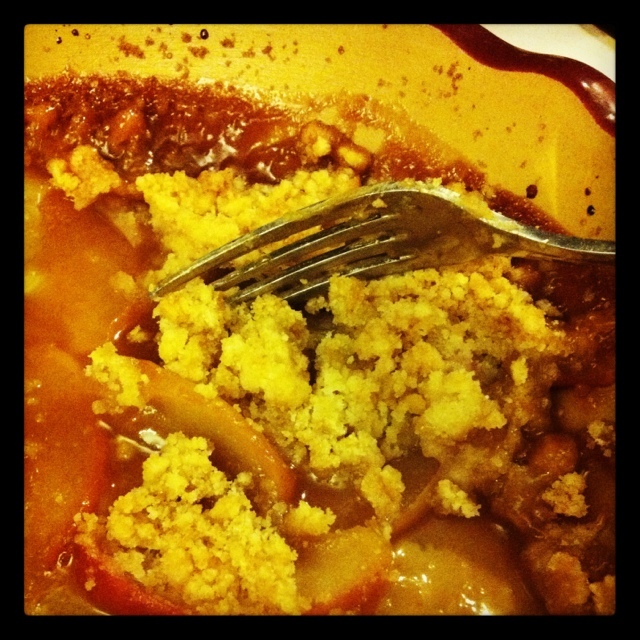 And I think that any foodie out there is well aware that a Baked Apple Crisp has quite a lot of brown sugar in it. At dinner, I did a great job of not eating everything on my plate (cause I had gotten an old-me-sized portion… as in, a big ol’ honkin serving). So I stopped when I felt a little bit of pressure. I only ate a few bites of the apple crisp. And that was that. It would have been a perfect evening… except I left out the remains of my meal while I bathed the boys. And then afterwards I came in and ate a few more bites even though I was not hungry. And then after I got both boys down, I snuck (and yes, I say snuck because I walked down the hallway extra quietly so that my husband wouldn’t know that I was finished putting down my oldest) into the kitchen and started chowing down on the leftovers in the baking dish. Oh my gosh. Sooooooo good. And then… the war began. Stop!!! January, stop! This is not right. This is breaking the covenant. This is gluttony. This is not what God wants. It’s not what you want. Yes it is… are you kidding me, this is flour and sugar and butter and more sugar. Why would I not want this? Why would God not want this? It’s not gluttony… it’s just enjoying good food. It’s not really breaking the covenant, I mean, it’s got apples in it for crying out loud! This is fine. I don’t need to stop. January. Stop. Think about tonight. Think about five minutes from now. Think about tomorrow. Stop. I. can’t. stop. It’s too good. I. can’t. stop. God, make me willing to obey. It’s was almost as if my fork was stuck in the next apple. I didn’t want it. I didn’t want to disobey. I wanted to obey. I wanted to be willing to obey. I was going to obey. And I will admit that I broke into tears at that moment. Because God is so great. Forty-two days in and He is greater than I imagined He could be. His Word… that one verse from just one day… written on my heart… swooped in and connected me to God in a way that saved me. And I stood in that kitchen by myself and raised my hands in thanks to the Almighty Of The Universe for His mercy. His compassion. His adoration. His Love. His help. His salvation. And I knew that immediately I had to come sit down at this computer and write this post. THIS post is totally going to be one of my memorial stones. I have been wondering what I could do… well, here was a moment where I needed to cross a river and God dried up the water so that I could pass… and here is a stone that I am picking up to remember that He is faithful and He is just to forgive me of my sins and to cleanse me from all of my wrongdoing and wickedness. Read your bible peeps. Read it. And you will. be. changed. I feel so much better today since I decided not to weigh anymore. I literally feel as if a weight has been lifted off my shoulders (hehe- pun). I wasn’t dreading my food selections this morning like usual. I didn’t look in the mirror and think “failure”. I didn’t even think about my weight. In fact, as I write this I’m having to really think to remember how much I weigh! So as I was putting words to that just now I started thinking “why?” Why would not-weighing give me so much freedom? 1. Weight is one of the world’s measurements of my value. And I no longer desire to be “measured” by the world. Sure I’ll still have the mirror as a “gauge” of my weight but it won’t be as black and white… fail or succeed… like it feels now. I already feel as if I’ll be able to get a better renewal going without those numbers daunting me. haunting me. pulling on me. 2. Weighing myself causes me to fixate on losing weight instead of thinking about eternal things. 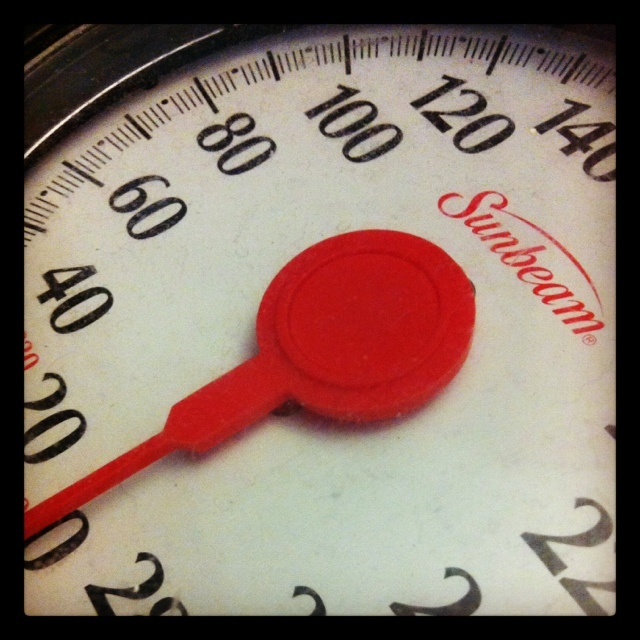 When I weigh myself or think about weighing, it seems to permeate my thoughts all day. I even made a note on my phone about what I should weigh by each week to lose the weight by the time June rolls around. I would find myself checking it and checking it. Almost… worshipping those smaller numbers. And so when I removed those numbers, when I removed that element out of my day to day attempts to focus on obeying God, pleasing God, honoring God with my body… it was as if I freed myself from a “restraint” the world had for me and I was suddenly light as a feather. Almost as if I was “above” the weight. “Above” having to weigh myself. “Above” the worry of such… mundane worldliness. Alrighty. I have made it to the “last day” of a three week Daniel Fast. Not that difficult! 21 days down and only 336 days to go! Haha! It’s almost like this should be my theme verse for what I’m doing with this covenant. I know that nutritionists have about a zillion different ideas of what is “good” for us and what is “bad”. I also know that their opinions of good and bad foods change and change and change. Like the poor egg for example… the nutrition industry just can’t seem to make up their mind! But anyway… the point is for thousands of years nutrition wasn’t even a word but The Word was very clear on food… don’t. eat. too. much. And that’s why I point to this verse. It’s not what goes in that is ruining me… it’s my heart that has been ruined. I need a renewal of the mind in order to not overeat… to not be greedy with my food. And I say this all to bring up what I am going to call the Cookie Dough Syndrome. 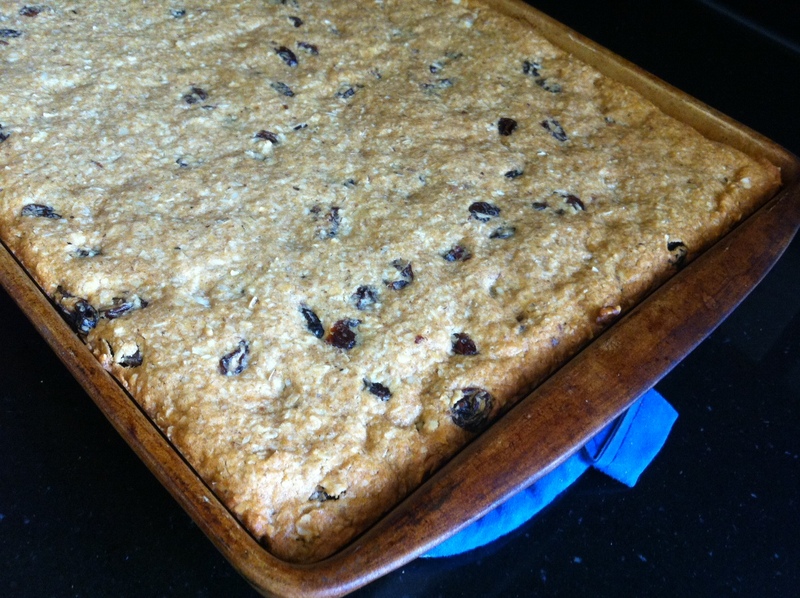 Before I started this diet I was making some cookie dough as a gift for my son’s teachers at school and it was a big ol honkin batch of cookie dough. And as horribly ashamed as I am to admit this, I almost feel that I need to… I ate almost the entire batch of cookie dough. Like, there wasn’t even enough to make them cookies. You might be thinking right now… Oh geez! She has a sickness. Seriously… that’s like gross. And trust me. I thought the same things. And every time I thought that… I ate more cookie dough. And that was pretty much when I knew that something… drastic… had to be done. My soul was sick. And only God could heal it. Now I bring up the random cookie dough story for a reason. In my effort to find some stuff within the parameters of my covenant, I went looking at some granola bars. They all had chocolate chips in them (except for some Special K bars but honestly… they were kind of gross). So, I decided to make my own. I found a recipe online and mixed all the stuff together. When it was all mixed, I took a bite and thought “Wow, that kind of tastes like cookie dough. Maybe this could be a way to get my ‘fix’ of eating cookie dough without actually eating it. It’s kind of a brilliant substitute…” So I ate some from the bowl with a spoon. And ohhhhhhh was it good. So I ate some more. And then some more. Stop. my mind said. This is not what you want. This is gluttony. Sure, it’s “healthy” but that’s not the point. This is gluttony. That, my friends, is Cookie Dough Syndrome. It wasn’t what was going into my body that was defiling me. It was my attidude. My approach. I reverted back into gluttony because I had given this food a “healthy” tag. Then my “old mind” suddenly jumped back in, “Oh okay… you can eat all you want if it is ‘healthy’.” And that’s one mentality that has helped me to become sixty pounds overweight. So, immediately after realizing this, I felt horrible. And Satan was on. the. ball. See, you can’t do this! It’s only day 21 and you’re already becoming a glutton again. You really think you can do a whole year of this? You’re going to let God down. Just go ahead and eat it. eat. eat. Eat. Eat. EAT. EAT. Sound like a familiar story? Satan telling someone to EAT… knowing that it was NOT what God wanted. It might as well be him saying: sin. sin. Sin. Sin. SIN. SIN. But let me tell you that God. is. good. And He loves me. And He wants me to be free. I’m not even sure if I really need to explain why this is relevant. (But because I always overdo it, I’ll explain anyway!) I needed the joy of His salvation (that salvation that I don’t deserve) to be restored to me. I needed a reminder. That He loves me even when I do what I shouldn’t do. That He loves me when I do what I should do. That HE LOVES ME. And then the second half of that verse. What a great prayer: make me willing to obey you. That’s the prayer I needed in that moment of weakness. Make me willing to obey you. Make me willing to obey you. Make me willing to obey you. Thank you for your salvation. Thank you for forgiveness. Thank you for your help. And just since we’re keeping it real… I can’t wait until Satan is locked up forever cause he realllllllly frustrates me. Please remind me over these next few days, weeks, and months that it isn’t WHAT I eat that defiles me, but what is going on in my heart. Restore to me the joy of your salvation, and please God, make me willing to obey you. Change my heart. Renew my heart. Create in me a NEW heart and renew a LOYAL spirit in me. Make me willing to obey You. But the granola bars look like they are gonna be pretty tasty… one. at. a. time. Glutton Free baby!!! !